Celebrate all things Rochester with the Red Wings on Wednesday, August 8 at ROC the ROC Night presented by the City of Rochester, ESL Federal Credit Union, Castle, C.P. Ward, Airport Transmission, The Exchange and Brickwood Grill. 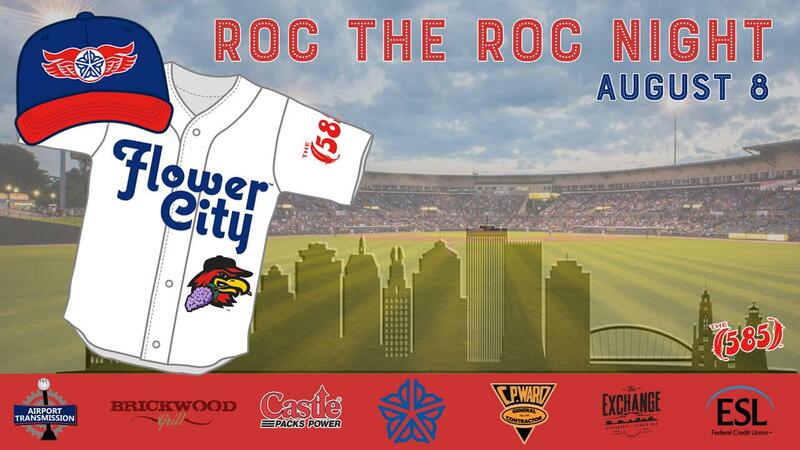 FLOWER CITY FEST: One of the great things about summertime in Rochester is the plethora of festivals, so we're bringing the Flower City Fest to Frontier Field for ROC the ROC Night. Flower City Fest will run Wednesday, August 8 AND Thursday, August 9 from when gates open until the end of each game. The fest will include numerous local artisans, live music, $2 beers, inflatables for kids, an Abbott's Food Truck (August 8 only) and of course baseball! The Flower City Fest will take place in the in the Red Wings Walk of Fame. PRE-GAME CONCERT: One of Rochester's longstanding, premier party bands, The Skycoasters, will be playing on field from 5:30 to 6:30. NATIONAL ANTHEM: Olympic Gold Medalist and Rochester Native Cathy Turner will perform the National Anthem. MONORAIL CAR: We'll have one of the monorail cars from the old Midtown Plaza staged for fans to reminisce and take photos with. Rochester will be wearing special caps and jerseys. The caps are blue with a red bill featuring a combination of the City of Rochester Flower logo and the iconic Red Wings logo made famous by the teams in the 1960s and 1970s. The jerseys feature Flower City across the chest with Spikes holding a lilac in his beak in the lower left front of the jersey. There is also a variation of the 585 area code logo on the sleeve with red feathers as the parentheses. The jerseys will be auctioned off using the Live Source mobile app. For more information on bidding click here. The auction will go live on August 8. The first 2,000 fans will receive a Mt. ROCmore mini statue which will feature four legendary Rochesterians wearing a different style Wings cap: Susan B. Anthony, Frederick Douglass, George Eastman and Morrie Silver. All Zweigle's hot dogs will be $1 and one stand will be dedicated to serving white hot dogs. Chicken French and a new dish, a white hot dog French, will be available at a pop-up stand near the main gate. Country Sweet boneless wings will also be available at Batter Up. Salvatore's Pizza is available at every Red Wings home game, at Mama Mittsy's Pizza Kitchen by Salvatore's. There will be a pregame happy hour in the 10th Inning Bar featuring live music and Genesee Beer specials. Abbott's Frozen Custard will also have a truck in the Walk of Fame area. The first 585 tickets sold beginning at 1 p.m. on Friday, June 8 will be $5.85. The next 716 tickets sold will be $7.16. Tickets can be purchased in person at the Red Wings Ticket Office or ONLINE RIGHT HERE. In-game music will be exclusively from Rochester-area artists with a couple members from Joywave leading "Take Me Out To The Ball Game" durnig the 7th inning stretch. All in-game promotions will be Rochester themed, of course. Stay tuned for more info on #ROCtheROC Night as we will be releasing some more info on the night in the coming weeks.